We have an impressive selection of religious, oriental and classic statues, but that is only a small part of what we offer. Featuring a full line of over 200 beautiful Cast Stone Planters & Pots in all types of shapes and sizes. We manufacture very large pots like the Del Grande Tree Planter and Giant Square Pompeii Planters or accent pieces such as English Urns, Assorted Vases and many more. Whether you are looking for Wall Fountains, Freestanding Two, Three and Four Tier Fountains – From Classic to Contemporary…we have fountains to suit each individual’s own personal taste and style. In addition to the outdoor garden fountains we manufacture on site, Artistic Statuary is a dealer for such well-known fountain brands as Henri Studios, Al’s Garden Art and Massarelli. Plus, we offer full delivery and setup of all the fountains we sell. 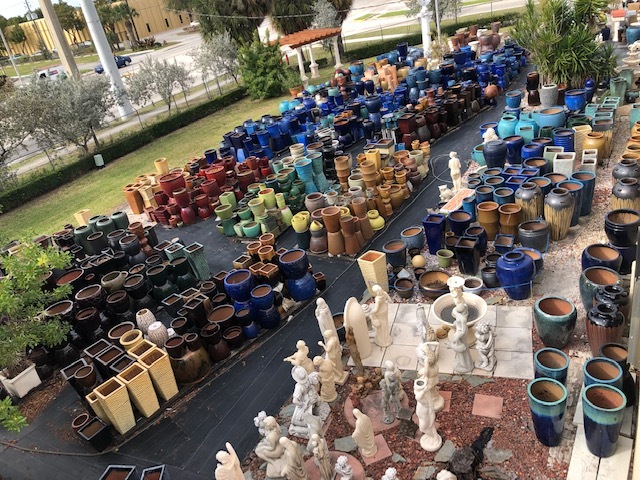 We have the largest selection of Lawn & Garden Art in South Florida including Concrete Table Sets & Benches, Balustrades, Columns, Pergolas, Finials, Fireplaces, Pedestals and Wall Decor. The architectural elements we manufacture can enhance all of your outdoor and indoor living spaces. At Artistic Statuary you’ll find colorful hand painted Mexican Talavera Wall Art and Planters, Italian Clay Pots; and we are direct importers of Vibrantly Colored Vietnamese and Chinese Glazed Ceramic Planters. All are available in a variety of sizes. For your pool, we manufacture scupper bowls in four different sizes and carry a line of bronze statuary featuring dolphins, mermaids, sailfish and cranes.